The pilot project of ‘Tashkent Loves You’ is completed! 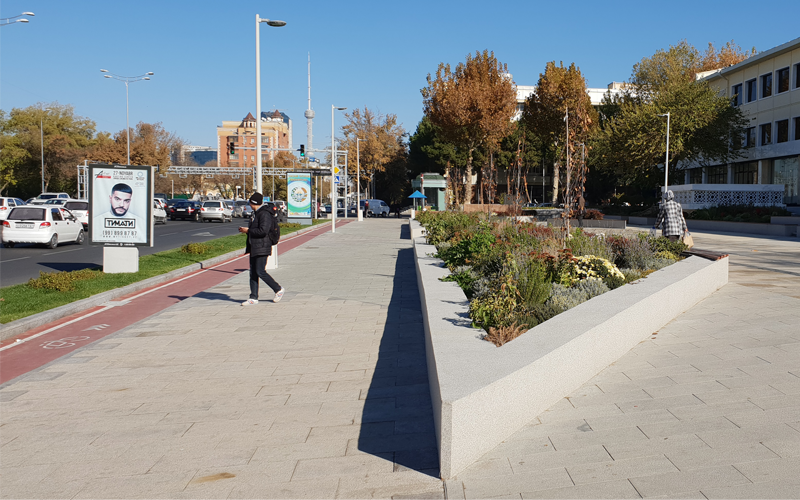 The redesign of Uzbek capital city’ streetscape conceived by Strelka KB and Systematica is now partially implemented, and Tashkent can now offer the first public realm designed for all mobility users: drivers, PT riders, pedestrians and …cyclists, for whom the first cycle lane was designed and realized! ‘Tashkent Loves You’ program is still on-going, with the complete refurbishment of 3.5 Km of Amir Timur street, the most lively and emblematic road in Tashkent. After having started the design process in Summer, Strelka KB and Systematica are proud to trigger such a positive change in the lively environment of Uzbek capital city. More info about ‘Tashkent Loves You’ initiative is available on Strelka KB Official Website.